We’ll be frank. Potato salad typically doesn’t excite us–except when there’s special ingredient or when it’s Peruvian style causa. 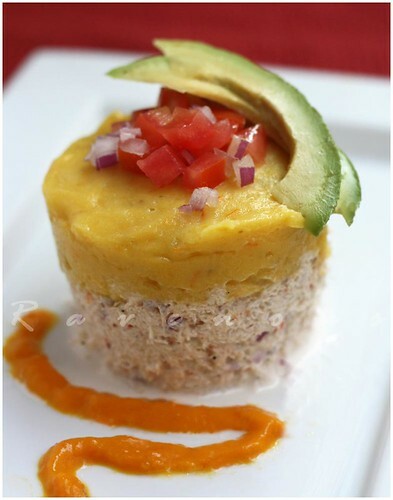 Causa is classic summer dish combining classic Peruvian ingredients of yellow potato with aji amarillo (yellow chile) along with any variety of protein such as tuna, crab/lobster, or chicken. Our first taste of this dish was at Mo-Chica Peruvian Resturant, and we loved the combination of sweet/spicy yellow potatoes, flavorful minced crab, and kick of the spicy aji amarillo. It was hearty, yet refreshing and of course the aji amarillo sauce was delicious, so this was one potato dish that we were dying to make ourselves. We recreated this dish and tried it with crab meat. First boil the potatoes with 1 ts of salt until fork tender. Drain and allow to cool, peel, and mash until smooth. Add 2 tbs of aji amarillo sauce (adjust to your desired level spiciness), olive oil, juice from 1/2 lime, and sugar and mix well and set aside. 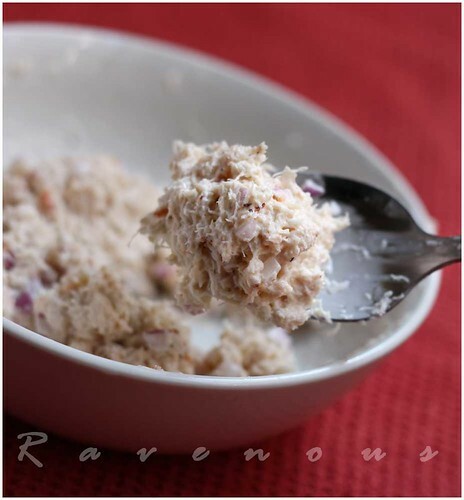 Combine the well drained crab meat with light mayonnaise, half of the diced red onions and season to taste with salt and pepper. Drain off any excess liquid. Using small ceramic dish, layer the crab mixture followed by the potatoes. Chill for about 1 hr. Top with diced tomatoes, red onions, and slices of avocado. To make individual servings, use a round mold. We made our own mode from cutting off the ends of a small plastic water bottle, and lightly oil the insides. Or, using a large piece of saran wrap you can layer the potatoes followed by the crab and diced tomatoes, onions and avocado and roll sushi style, chill, and cut. Apply generous topping of aji amarillo sauce and optional sliced boil egg and olives and we can guarantee that this will be one of the best potato salad you’ll ever had. Very nicely done! Peru is my favorite country that I have visited The food is exquisite! This looks delicious. What a beautiful dish! Potato salad and crab? YUM! Everything you guys make looks so beautiful and delicious. I will be referencing your site a lot for future Vietnamese food cooking. gorgeous presentation!! looks delicious too. This potato is a WINNER! This looks wonderful and tasty! Looks excellent. I love Peruvian cooking. We are making oyster tacos with aji amarillo sauce this weekend! miakoda: Colorful and tastes great too! Rose: Thank you! Can you tell we've got the Peru food bug too? Cookie: Yeah…it's actually great combination!! Thrifty DC cook: Thank you so much. We love to showcase the awesomeness of Vietnamese cuisine. Krissy: Def. try Mo-Chica's when you guys get the chance. Hummingbird: Try it–we know you probably don't have access to aji amarillo, but try sriracha instead! LL: OOhh…looking forward to reading your posts on that! Hmmm so Summery!! I'd have crab with anything, me!!! That is a CREATIVE dish! Well done! What a lovely presentation! This looks delicious! Ruth: We made this again for a bbq and people just stared and then gobbled it up..no one had ever heard it before. Poor egg salad that someone else made was hardly touched! thanks–this is the exact Mo-chica dish I was trying to replicate. The version I had yesterday had green sauce, tho, not yellow-red. Maybe a chimichurri variant? I looked for the peppers at the Super King (on San Fernando) which normally has EVERYTHING, but no dice. I'll have to try the Jon's nearby…nice work! Anne: Yes, it was a slightly different sauce, I think the black mint huacatay. But aji amarillo sauce tastes great! 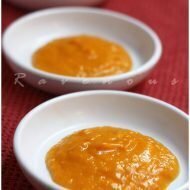 We used it as a steak sauce and it's sweet and spicy at the same time..great! Thanks for the tip. 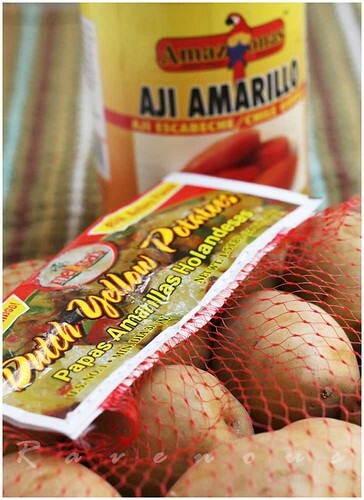 I can never find Aji Amarillo. But Sriracha as substitute? Really? This recipe is great companion, as well as the effect of generic viagra, fixed this recipe goes to my cookbook …. Wow nice dishes. Like the dish preparation. Would be delicious. Nice blog like that.